To Dr. Palmer and all the teachers, staff and administrators of the Westport Public Schools, thank you for your dedication to my children and all of Westport’s students. You have enormous responsibilities and pressure. You are overworked, underpaid and underappreciated. Thank you for looking out for my children’s emotional and physical safety as well as their education. In difficult situations and uncertain times you are faced with making quick and real time decisions with incomplete information, knowing you will be criticized by someone no matter what action you have taken. Nevertheless you continue to prioritize your students and greet them with confidence, dedication and optimism each day. 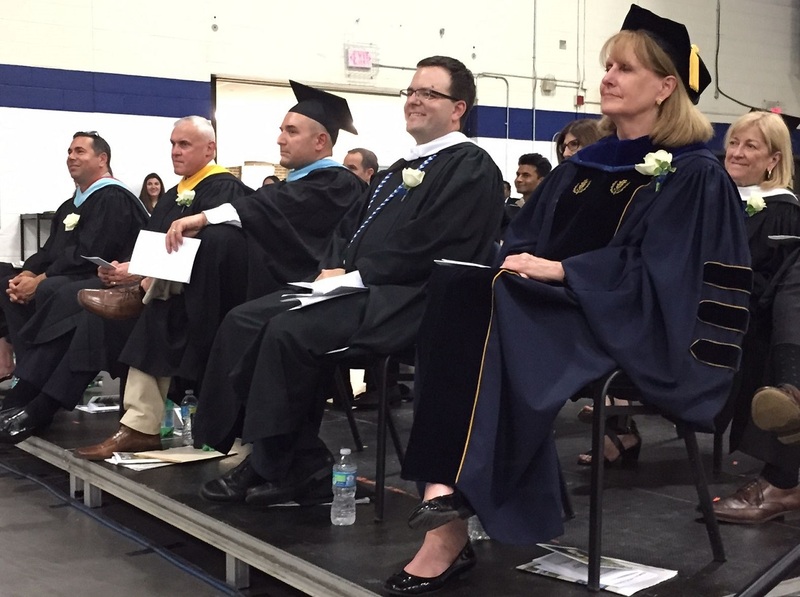 Listening intently to the student speakers at last June’s graduation were (from right) superintendent of schools Colleen Palmer, principal James D’Amico, and assistant principals Pat Micinilio, Rich Franzis and James Farnen. Westport parents, we need to be supportive of educators, administrators and those within the school system. They prioritize our kids’ safety and we need to trust that they know best how to do that. We have to be OK not knowing everything and letting the people we entrust our kids to do what they need to do. Information that is ours to know will follow if/when appropriate. It’s not easy, we all have mamma bear and papa bear instincts. But we are only hindering efforts and jeopardizing the safety of the one’s we are trying to protect by demanding information and criticizing action taken and information shared. To Dr. Palmer, administrators, teachers and staff you have my support and trust. Thank you for prioritizing my children and keeping them safe. You are appreciated and respected for all that you do. Thanks for writing this. And I’d add my own thanks, to the Westport Police Department. They were superb today as well. This entry was posted in Education, People, Staples HS and tagged Dr. Colleen Palmer, Westport school district. Bookmark the permalink. Very well said. I completely agree. Thank you. Agree. Thank you for posting. I feel exactly the same way and grateful for all the support. Ewell said and well deserved praise to everybody in a difficult situation.. Thank you all of the departments in Westport that dealt with this today. And also a big thank you to the child who spoke up in the first place. Glad they heard this child say something and reported it. There could have been a very different outcome today. But thanks to the quick response by the administrators and Police Department, they averted a potential shooting! Well done!!! Yes yes yes yes yes!!! Preach on, we have incredible police, local govt, school administrators and people in this town. We can set an example for other towns. It is so easy to ask questions and pick things apart and so hard to complement effort and have faith that people do their jobs with integrity and pride. Well done everyone! Dont stop here, keep bettering our young, guiding them to help others, building friendships, crossing barriers, and working together to include everyone in all areas of progress! Sorry, while I understand the sentiment of this letter it feels premature. We deserve to get more details. They let the kids go through an entire day of classes as usual from 9am until 1pm while they interviewed the student and looked for guns at his home. While we were being told no threat and abundance of caution, GFA parents were told at 2pm that there was an incident and the student involved had been taken to the hospital. While I am appreciative of the work done today, I need more information before I say what an amazing job was done and most importantly before I can say I will blindly trust my children with anyone. To the Author – As a former high school principal, district administrator, and Westport resident, I thank you for your clarity in thinking and the eloquence of your message. With all the praise, and all deserved, we have to thank the student, who decided to say something. It was so brave and it appears to have saved lives. Whoever is this wonderful high schooler, we cannot thank him/her enough!! Our daughter is home tonight, and safe. Very very well said. The message needs to be heard. I’m thinking “THANK YOU” to the STUDENT who overheard the threat and reported it in the first place! (In addition to the other thanks). Just sayin’. Another teen hero ! Woo hoo!